On Wednesday, when you type www.liu.se into your browser, the page that loads will be completely different. Because we will have switched to the new LiU website. 15 February is a milestone in LiU’s history. It’s when the we leave behind a 20-year-old website with more than three million pages, and shift up to a slimmed-down, state-of-the-art site, that much better meets the visitor’s needs. 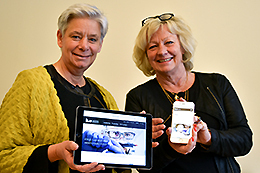 “Today, the purpose of a website is to serve the visitor, and to ensure they find what they’re looking for as easily as possible,” says LiU’s Director of Communications Mariethe Larsson, who together with Chief Information Officer Joakim Nejdeby has been in charge of developing the new external website. The website project has run from 2013 to 2016, with many staff members being involved. It has been a complex project, partly because technology had to be developed to link the new website to the programme database Bilda, DiVa, Lisam and MinIT, so that information can be automatically accessed. “It is important that we all help out as the new LiU website is opened, and that the transfer takes place smoothly. Only if we all pitch in can we demonstrate that the motto “Innovation is our only tradition” truly captures the spirit of LiU – including the website. I also want to sincerely thank everyone who has worked so hard over the past few years, enabling us to reach the finish line now,” says Vice-Chancellor Helen Dannetun,. Jörgen Nybrolin has been project manager for the new website since August 2016. One positive result of the website project is the faculty-wide study administrative information, which means prospective students can more easily compare content and setups of different courses and programmes. Previously this was arranged differently in different faculties, which made it difficult for students to compare. Additionally, these pages will be developed further this spring, becoming even more informative. The project has been more complicated than Jörgen Nybrolin expected. Seemingly simple requirements turned out to be a real challenge. Couldn’t the launch have been delayed a bit? The past months have been very busy times for editors and developers, and after the launch, development will continue through the spring. The list of things to finish is long. But the work won’t end there; today’s websites require constant maintenance, to stay up to date. “This is the first step, and we’re delighted to have got this far. But the website, which is our most important communication channel, has to continue to evolve, in line with the requirements of the users,” says Mariethe Larsson. Have you got any questions about the new website? Or the old one? Our website editors have answered some common questions.